Gold is gold is gold is gold; as a commodity, the only reason to buy gold of the same purity from one trader instead of another is price. Many consumers now think of some legal services – such as uncontested divorce agreements, wills, and business formation documents, all available inexpensively on the Web – as commodities differentiated only by price. Before more legal services become commodities, learn how business model innovation can differentiate your law practice from others. You’ll not only protect your income, you’ll be a better advisor to business clients. ommodity is likely the last word attorneys would use to describe their legal services and knowledge. Attorneys’ advanced degrees and personalized, professional approaches to client assignments suggest anything but the provision of “commodity” services. Most industries have matured, so that knowledge and quality that once separated competitors are now commonly available. Excess supply exists in most markets owing in large measure to the Internet, which has erased geographic boundaries, allowing companies to compete anywhere. Retailers use store brands to pressure manufacturers to reduce their prices. The Internet makes price shopping effortless for consumers and forces manufacturers into online auctions to win retail-store shelf space. A growing business service sector enables competitors to quickly copy good ideas. Customers have more control of companies’ images due to the rise in blogs. Businesses try to escape commoditization through product innovation, branding centered on emotional benefits, and improved marketing communications. At the same time, they’re in a mad dash to remain price-competitive by cutting costs through outsourcing and process improvements. But these strategies do little to offset the forces accelerating commoditization. As a result, even customers who formerly were brand loyal are making decisions based on price. Attorneys assume their services won’t be commoditized because they’ve mistaken commoditization myths for market truths. If you understand why these myths are false, you’re one step closer to retaining or building a differentiated legal practice. Myth: You need a lot of competitors for a price-driven commodity market to emerge. Fact: As few as two law practices meeting clients’ requirements can give rise to commodity-like price-driven competition. For example, if a company’s inside counsel deems both Firm A and Firm B as qualified to address the business’s legal needs, and sees no differentiating benefit from working with one firm versus the other, price will drive the owner’s choice. In fact, RFPs, in describing (often in considerable detail) what is required, “productize” the desired legal services, making price the only differentiator among qualified legal service providers. Myth: Relationships keep a professional practice from becoming commoditized. Fact: Relationships that don’t translate into real benefits or cost savings don’t influence which firm a client will select, unless everything else including price is comparable. Myth: A customized service is unique by definition. Thus, it can’t become a commodity. Fact: Customization does not preclude commoditization in manufacturing or in professional services. Clients usually focus on outcomes, not on how the outcome is reached. Clients are interested in how you run your practice only to verify your stated expertise and references. Any legal service is at risk of being commoditized. Attorneys who fail to think proactively about what might differentiate their firm’s services should be prepared to gain clients or lose clients based on price. Practices consolidate in recessions to cut overhead costs, resulting in larger firms that then often price on the margin to secure work to cover such costs. Banks and accounting firms, seeking to preserve income, create services for their consumers that reduce the amount of legal services needed for a transaction. Clients whose incomes are falling seek legal service providers who discount fees. Competitors intensify their marketing efforts and expand into new markets to secure new clients during recessions, often using lower prices to win new clients. Disruptive innovation also increases during recessions. Disruptive innovation arises when a new entrant to an industry or category creates a stripped-down version of a product or service to better serve customers who were over-served by (and therefore perceived themselves as being over-charged for) an industry’s mainstay offerings. The disruptive innovator brings more customers into the market, customers who would not buy the higher-price offerings. The hourly fee billing model for legal services set up the legal “industry” for disruptive innovators. One of the legal industry’s disruptive innovators is LegalZoom.com. This Internet-based law firm has commoditized straightforward legal procedures like wills and business formations, offering them online at substantial discounts. Other new entrants, along with LegalZoom.com, will productize still other services, and over time, people will become more trusting of this new mode of law practice. Mediation practices are another example of disruptive innovation, as is collaborative divorce. Business model innovation is the only protection against encroaching commoditization. All law practices, accounting firms, manufacturing businesses, and even nonprofit organizations have a business model, whether or not their leaders formally articulate the model. The business model carves out the business’s market space and its profit formula. Five interdependent strategy questions define an organization’s business model. While the questions are deceptively simple, answers that lead to price and profit premiums and a growing client base are much harder to unearth. What is your value promise that leads clients to select your services? Why can’t competitors copy your value promise? In other words, what hard-to-copy competencies, assets, and other advantages enable your firm to uniquely deliver on this value promise? The strongest business models offer a unique and defensible value promise. Here is an example. Target market: Business owners getting divorced or at risk of getting divorced some day. Value promise to clients: We minimize the risk of you losing your business. Advantage: A proven superior track record of divorced clients who retained their businesses; teacher of divorce law at a prestigious law school. Profitability: We are profitable because we earn the highest retainer and fees in our region for divorce law. Clients pay these fees because they view them as insurance protecting the client’s wealth and job. A business model does not just apply to solo and small practices. It exists for focused practice areas within a firm (for example, environmental law) and for the firm overall. Kay Plantes is an MIT-trained economist and owner of Plantes Company LLC, a management consulting firm specializing in business model innovation and strategic leadership. She is author of Beyond Price: Differentiate Your Company in Ways that Really Matter (Greenleaf Book Group, 2009) and writes a monthly strategy column for the Capital Region Business Journal, a publication of the Wisconsin State Journal. Contact her at com kay plantescompany plantescompany kay com. Here in Wisconsin, Harley-Davidson (Harley) is a great example of a business model that generates price premiums. Harley’s target market is anyone who loves the motorcycle culture, not just bike owners. To serve this market, Harley has defined its business differently than have its competitors. Harley is in the motorcycle experiences market. Its offerings include clothing, furniture, clubs, rallies, a museum, tattoos, and vacations: in other words, far more than motorcycles and motorcycle service alone. The breadth of this offering enables Harley to gain and retain customers by promising to deliver an authentic experience of freedom and the rebel culture. With this value promise, Harley has gained and retained customers and increased revenue per customer. In fact, behind every profitable and growing business is a unique business model that enables the business to do one of two things: either compete successfully on lowest price because the business has the lowest cost structure (the Wal-Mart business model) or attract and secure customers due to unique benefits that are compelling to customers and hard for competitors to copy. In late 2008, Apple’s cash on hand exceeded Dell’s entire market valuation. Guess who has the stronger business model? 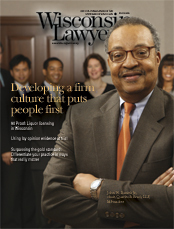 Larger law practices are in a different business than niche practices. How can large firms’ broader offerings benefit clients compared to what niche firms can do for their clients? The answer must not be one lawyer versus another, because larger firms come with higher overhead costs. The answer must rest in what attorneys in the larger practices can do together to benefit their clients that niche practices can’t do as well or as readily. Attorneys in large firms must realize that their organization’s strength is about more than the excellence of its parts. While legal practices were built on the excellence of individual attorneys, they thrive when competent lawyers work together to fulfill a highly appreciated and unique value promise that makes clients want to work with them again and again. Accounting partners are learning that the more the partners and associates work together in ways that benefit clients, the stronger their value promise can be as compared to the traditional “you eat what you kill” approach to professional services. How can niche firms beat the larger practices? Neider & Boucher offers one example of how this is done (see the accompanying sidebar). And, how can one large practice offer more value than another? This is perhaps the hardest question to answer, and it must be answered for both categories of services and the firm overall. Accounting firms, for example, are developing deep industry expertise that enables them to make recommendations that can significantly increase their clients’ profitability. 1) Why should clients work with you, versus other firms that also are qualified to meet their needs? Be careful to answer this question from the client’s perspective. A business client, for example, most values business services that will increase the client’s revenue, reduce its costs or risks, increase its asset productivity, strengthen its market position, or enhance its reputation in the eyes of its customers. Attributes are things about your law practice that create these benefits. Do you have stronger or unique benefits? If not, you’re in commodity territory. 2) If you have a differentiated value promise, don’t rest on your laurels. What skills can you develop to make your value promise even more relevant, compelling, unique, and hard to copy? We work in a copycat economy in which competitors emulate others’ good ideas, creating more price-driven competition. The commoditization process is the gravitational force of the economy. You must keep improving your advantages to escape it. 3) If you lack a differentiated value promise, what problems and frustrations do your clients face with legal services? What does or could your organization do or have that no competitor could easily match that would address these challenges and greatly benefit current or potential clients? 4) How might you disrupt your own services to significantly decrease charges to clients for some or several services? 5) Would a different revenue model build a higher value with key clients? With these answers in hand, step back and identify your organization’s business model today and envision what you’d like it to be in the future. Then identify what you need to change to move from your current business model to the new business model and who in your organization will lead these changes. In today’s increasingly complex and fast economy, you must think strategically about your business model. Otherwise, today’s satisfied clients and referrals may be gone tomorrow. Stated more simply, if you can’t be the legal industry’s Wal-Mart, avoid becoming its Sears. Differentiate your practice in ways that really matter to a group of clients.